While the actuals will come out tomorrow, that It managed to snag $17M in its fourth weekend is rather extraordinary, for a horror movie anyway. The genre is typically very frontloaded, but the adaptation of Stephen King's novel has been floating at the top since the beginning, and at this point has $553M worldwide. Tom Cruise's drug-running film American Made opened with a solid $17M domestically, which isn't bad for the $50M feature. While that ranks as one of the lowest debuts of his career, who cares when his international star power has already earned it an additional $64M for $81M worldwide. 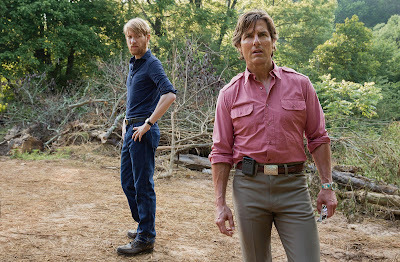 And let's be honest, American Made doesn't have anything to bank on other than Cruise and positive reviews. The film finds him as Barry Seal, a real-life figure in American political history, who smuggled drugs for Pablo Escobar, smuggled guns for the Reagan administration, and got in hot water with basically every federal agency in the country. It's a good film and perhaps the best showcase for Cruise in years, so it's good to see the film doing well. It may not be a blockbuster, but it doesn't really need to be. Sequel Kingsman: The Golden Circle fell 56% for $17M (we basically had a three-way tie at the top), giving it $66M domestic and $135M worldwide. At this rate I doubt it'll reach the $400M heights of Kingsman: The Secret Service, but don't worry, we'll still probably get Kingsman 3. Looks like you can't just Lego-ize anything and make it a hit. The LEGO Ninjago Movie only hit $12M in its second weekend, building to a $35M total. That's a far cry from the $469M of The LEGO Movie and $311M of The LEGO Batman Movie, but what we are clearly seeing is a downward trend that Warner Bros. must be concerned about. The other major new release this week was the remake/sequel Flatliners, which Sony must've known was terrible because they wouldn't screen it for press. Always a bad sign. The horror, a redo of the 1990 movie best known for starring Julia Roberts, Kiefer Sutherland, Kevin Bacon, William Baldwin, and Oliver Platt, opened with a measly $6.7M and a ton of bad reviews. That 0% Rotten Tomatoes score isn't going to put more butts into seats, that's for sure. There was simply no buzz for this film and a decided lack of marketing, despite a cast led by Ellen Page, Diego Luna, and Kiersey Clemons. Those are three fan-favorite actors but you'd barely know they were in it, to say nothing of Kiefer Sutherland's cameo appearance. The Emma Stone/Steve Carell tennis dramedy Battle of the Sexes expanded to over 1200 theaters, but faulted with just $3.4M. The reviews have been good (I loved it) for this story of the historic match between Billie Jean King and Bobby Riggs, so perhaps when it expands further more people will turn out to see it. Or perhaps nobody wants to watch a tennis movie? Slipping through the cracks is thriller Til Death Do Us Part, starring Taye Diggs, Stephen Bishop, and Annie Ilonzeh. The film sounds a lot like the Julia Roberts thriller, Sleeping with the Enemy, and earned $1.5M in just 562 theaters.